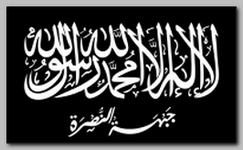 The Al-Nusra Front or Jabhat Al-Nusra – Jabhat an-Nuṣrah li-Ahl ash-Shâm – in Arabic “The Front of Support for the People of the Sham (Greater Syria), is a branch of Al Qaeda operating in Syria and Lebanon. The group announced its creation on 01/23/ 2012, during the Syrian Civil War (see – SYRIAN 2011 UNREST). Since then it has been described as “the most aggressive and successful” or “one of the most effective rebel forces” in Syria. The group has been designated as a terrorist organization by the United Nations, the USA, Australia, UK,and Turkey. The leader of Jabhat Al-Nusra goes by the name of Abu Mohammad al-Jawlani (or Joulani) which implies that he is from the Golan Heights (al-Jawlan, in Arabic) occupied by Israel since 1967. Very little is known about him, with even his nationality unclear. The group is made up of Sunni Islamists, many of them fought in Iraq a decade earlier under the command of Abu Musab al Zarqawi. Its goal is to overthrow the Assad government in Syria and to create an Islamic state under the Sharia (Islamic law) and aims to reinstate the Caliphate. In early 2014 a top Sharia official in Al-Nusra, Dr Sami Al Oraidi, acknowledged that his group is influenced by the teachings of Mustafa Setmarian – known as Abu Musab al-Suri. Jabhat Al-Nusra is accused of attacking the religious beliefs of non-Sunnis in Syria, including the Alawits. Some analysts and diplomats believe that Al-Nusra Front (and also I.S.I.S) appear less focused on toppling the Alawite Assad regime than on establishing a zone of influence in Iraq and Syria and eventually establishing an Islamic territory under their administration. At least one Arab government has accused Qatar of helping Al-Nusra. Jabhat Al-Nusra has also been materially supported by multiple foreign fighters. Most of these fighters are from Europe and the Middle East, as pipelines to Syria from those locations are better established and navigable. However, as of 11/2013, there were also 6 publicly disclosed cases of American citizens and permanent residents who joined or attempted to join Al-Nusrah in 2013 alone. In 04/2013, Abu Bakr al-Baghdadi, the head of I.S.I.S, announced that his group had merged with Syria’s Jabhat Al-Nusra and announced the formation of the Islamic State of Iraq and the Levant (Sham in Arabic). Al-Nusra leader Abu Mohammed al-Jawlani acknowledged a relationship between the two groups, but he denied there had been a merger and publicly pledged his allegiance to Ayman Al Zawahiri. But Ayman Al Zawahiri, now the new Al Qaeda leader ruled out that the Islamic State of Iraq I.S.I and Al-Nusra should operate as separate entities, according to a letter released to Al-Jazeera. al-Baghdadi had “made a mistake” by announcing a merger “without consulting us”, he said. It is assumed that the ambition of Abu Bakr al-Baghdadi to establish a new Caliphate with him as the Caliph and the spiritual head of all Sunni Muslims is the heart of the controversy between Zawahiri and al-Baghdadi. Zawahiri also opposes the stand of al-Bbaghdadi to brand the Shiites, all of them, “infidels” and to fight them rather than to focus the efforts on fighting the “Crusaders” – the Western powers (see also – Hassan Ghul ‘s letters ). Al-Baghdadi, however, dismissed al-Zawahiri’s ruling and took control of a reported 80% of Jabhat Al-Nusra’s foreign fighters, about 4,000 of them citizens of the Western Democracies. In 01/2014, I.S.I.S expelled Jabhat Al-Nusra from the Syrian city of Ar-Raqqah and Deir ez-Zor in the Euphrates Valley of Eastern Syria. Hundreds of fighters were killed in the clashes In 02/2014, Al-Qaeda disavowed any relations with I.S.I.S. ** Following the success of the Syrian army to establish an effective siege on Aleppo, by late 07/2016, and the splits within the Islamic opposition in Syria, mainly between Jabhat al-Nusra and the Islamic State fighting each other, the Nusra leader Abu Mohammed al-Joulani appeared, distributed through the web on Thursday 07/28/2016, in a rare footage announcing group’s split from al-Qaeda (after an earlier confirmation of Ayman al-Zawahiri, “We declare the complete cancellation of all operations under the name of Jabhat al-Nusra, and the formation of a new group operating under the name ‘Jabhat Fath al-Sham (The front of Mesopotamia)’, noting that this new organisation has no affiliation to any external entity,” he said . The announcement is aimed to bypass the general embargo and sanctions policy against al-Qaeda and to pave the way to greater coordination and cooperation between all Islamic militias. Including between the two bitter rivals fighting each other – al-Nusra and ISIS. The split from al-Qaeda will enable Gulf Emirates, Turkey and other Sunni Arab countries to increase their support to the new “Jabha (front)’ and to other sunni groups fighting the Iranian backed Shia Alawite regime in Syria .